Despite the fact that CACs serve many more victims of child sexual abuse than they do victims of child physical abuse (CPA), federal data show that physical abuse is far more common, potentially indicating that CACs without a specialized response to physical abuse may be unequipped to serve a large population of child victims of abuse within their jurisdictions. As part of ongoing work to develop helpful tools and guidance to improve CAC service delivery to children and families, National Children’s Alliance (NCA) convened a collaborative workgroup on the subject of expanding CAC delivery of evidence-based services to victims of physical abuse. This group, comprising professionals representing all of the disciplines required within the multidisciplinary team (MDT) disciplines under NCA’s Standards for Accredited Members, worked to develop the following information and resources that will provide guidelines and recommendations both for CACs currently providing services to victims of physical abuse, or those who are considering expanding or enhancing their services for this population. The objective of this guide is to increase the number of CACs delivering evidence-based intervention designed to meet the specific needs of physical abuse victims. 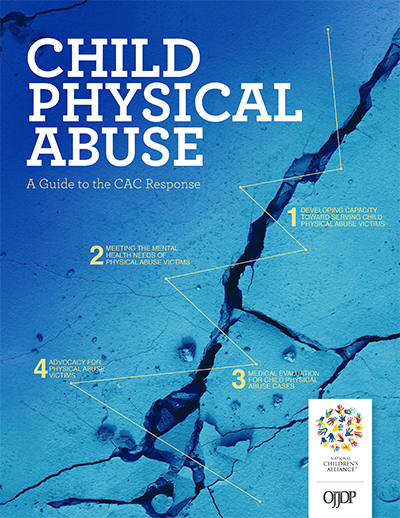 In this guide, CAC directors, staff, boards, and MDT partners will find considerations, tips and resources for CACs and MDTs providing services to child victims of physical abuse to help them meet this objective at their individual CACs. covers a distinct discipline necessary to serve CPA victims, all sections are intended to be read by the entire complement of MDT members and CAC leadership. Integral to the success of the CAC and MDT response to physical abuse is the deep, interdisciplinary understanding of the role of each provider among every member of the team. Special thanks to the many contributors to this guide who sat on our Physical Abuse Collaborative Work Group, and to Jan Dunn, NCA’s project lead. This project was supported by Grant # 2015-CI-FX-K002 awarded by the Office of Juvenile Justice and Delinquency Prevention, Office of Justice Programs, U.S. Department of Justice. The opinions, findings, and conclusions or recommendations expressed in this publication are those of the authors and do not necessarily reflect those of the Department of Justice.